Companies can no longer settle for incremental improvement in today’s rapidly evolving and increasingly global economy. McKinsey Quarterly, in their June 2011 issue offered the suggestion that in order to sustain high performance, organizations today must build the capacity to learn and keep changing over time and suggested that organizational health was perhaps the ultimate competitive advantage for today's economy. I can not stress more strongly how important the role of the CEO is in visibly participating in the transformation and how the CMO can assist in this process. I believe there is no single model for success, and actions will be influenced by the magnitude, need and nature of the change for an organization. But, in my experience there are four basic change management steps that I’ve found always apply and can be scaled to fit every organizational transformation. The premise of these four steps is based on two important tenets that I believe must be considered when implementing an organizational transformation. First, it is people and relationships that make up organizations, not buildings, systems or processes. And second, most people don't like being forced out of their comfort zones and they must have a reason to do so. 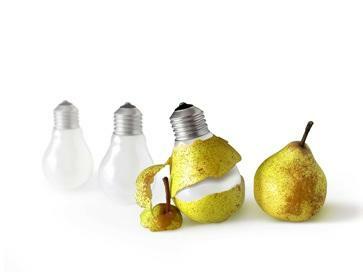 With that said – lets review the four steps for integrating change management into a new business strategy. A problem statement: Identify the need for change. As the CEO, this is critical. You need to explain why are you changing the organization. How does it affect the company and what specific internal challenges are there with this? The risk if change does not happen: Employees need to hear from you as the CEO what is the risk to the company, to them and your brand if this does not succeed. Explanation of the benefits of making changes: Explain not only the benefits for customers but the potential benefits to the company. Get specific by organization, department and if possible to a group of individuals. Organizations are made up of people, and this part of the message explains how each of them participates. It answers the proverbial ‘what’s in it for me’ question so often overlooked. As CEO you need to ensure that everyone sees the need and understands those benefits in order to potentially risk moving outside their comfort zones. Not everyone may perceive benefit from these changes, and you should be aware of that as well. Step 2 – Develop a detailed internal communication plan. Working with your CMO and HR team to develop and implement a thorough internal communication plan is vitally important. As CEO, you need to make sure this plan is clearly owned with responsibilities and expectations clearly defined. Whether a team or an individual manages the plan will depend on your organization, but above all you must hold those responsible accountable and give them the authority to make tactical decisions and adjustments on implementation. The goal here is to identify stakeholder segments and develop a communication plan appropriate to each segment. Knowing stakeholders defines the analysis and involvement role each plays in the implementation of the transformation. The owners of the internal communication plan you appoint must understand the organization and have the capability to listen, empathize and adapt to feedback from the organization. You and the executive team will need this feedback, and depending upon the complexity of the organization, you may well need some external resource consultants to assist them. Build your internal communication plan to identify and categorize stakeholders according to two qualities: interest and power. Interest: Who does this change impact? Stakeholders hold an interest in the change to the degree to which they are impacted by the change. High-interest stakeholders are greatly impacted by the change; low-interest stakeholders are minimally impacted by the change. Power: Who can impact the change necessary to make the transformation a success? While it’s vital you be visibly supportive of these changes, power here refers to the level of formal or informal influence a stakeholder has within the organization and your management team. Your implementation team can identify stakeholder power, interest and communication needs by using a Power-Interest Matrix diagram like this one. If you're not participating or advising directly, you should at least review and approve this document when complete. The accuracy and implementation of this transformation will rely heavily on reading your organization and its informal and formal communication culture correctly. Identify stakeholders in four ‘blocks’ of behavior in the XY grid above with low to high power running on the vertical axis and low to high interest running along the horizontal axis. High Power – High Interest Stakeholders: These are identified in the upper right block. These people are key to your success, and are not necessarily high ranking executives on your management team. These stakeholders should be fully engaged in external and internal rollout planning and decisions. 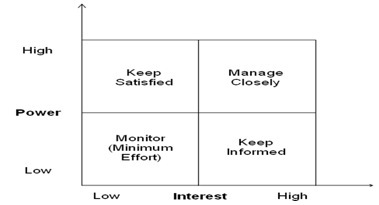 High Power – Low Interest Stakeholders: Represented in the lower left hand quadrant on the stakeholders chart, these people need less information and less involvement than the high interest stakeholders. But, because they do have power within the organization—formal or informal—to impact the change, it is important to keep them connected and satisfied on progress, but not so much as to overwhelm them with details. Low Power – High Interest Stakeholders: Represented on the lower right hand quadrant, these are individuals within your organization that may have great knowledge of the company but have low influence on change in the organization. It is important to keep them well informed so that you can get their valuable feedback. They can help you solve problems when they arise or guide you on how to avoid them in the first place. Keep them informed. It’s important to understand that choices may need to be made. It may not always be possible to find win-win solutions for every stakeholder group. These situations need to be carefully identified, considered and planned for. Step 3 – Identify your Cheerleaders. When there are tough decisions to be made and to convince people that this transformation is necessary, it takes strong leadership from you as the CEO and visible support from key people within your organization – your cheerleaders. You will find cheerleaders most likely among the high power and high influence stakeholders identified previously – and that means they are not necessarily just on your executive management team. Cheerleaders won’t necessarily follow the traditional company hierarchy. Managing the change necessary to support the transformation isn't enough – you have to lead it, but as CEO you can not do it alone! To lead change, you need to bring together a coalition, or team, of influential people whose power comes from a variety of sources, including job title, status, expertise, and organizational political importance. Once you form them, your change cheerleaders need to work as a team, continuing to build urgency and momentum around the need for change and implementation of the transformation. Step 4 – Of course, implement the plan! No matter the urgency of a transformation to market leadership for your company, implementing change in an organization can take a great deal of time. Yet, there won’t be a successful transformation if the moving parts of the organization are not in alignment to support it. This is why planning for organizational change can’t happen AFTER you decide for the need to transform the company – it needs to be part of the development of the strategy and plan. It’s doubtful you can wait to do this serially – and so a roll out plan needs to adjust for that. Much may need to be done in tandem, in limited roll outs, or some other manner. This will depend on your company and market situation. In most cases in large global organizations it takes a modified approach. But, no matter how you’re implementing, there are some very important factors to consider at this point in your plan. First, there is a need to celebrate short term wins – loudly – not just externally but especially internally. Everyone loves positive momentum. Create it – and celebrate it. Next, make sure your managers and leaders do their job and eliminate obstacles and roadblocks. Encourage everyone to watch for them – plan for them ahead of time – and diligently work to let people to do their jobs. And lastly, follow the communication plan. Empower the team to execute and lead the plan across the organization considering all the issues we have identified here. Transformation is often complex and should not be taken lightly. Each of these four steps are worthy of far more discussion and debate and can benefit from outside consultation as well. I put them here in bite-size pieces for you. To make any transformation stick it has to become part of the core of your organization. As CEO, your corporate culture often determines what gets done, so the values behind your transformation vision must show in day-to-day work. Make continuous efforts to ensure that the transformation success is seen in every aspect of your organization. Don’t invest the time and valuable dollars in determining a transformation strategy and implementing it without adequately addressing the importance of organizational alignment. While this seems obvious – it’s the root cause of many business failures and can not be emphasized enough.